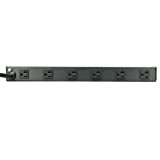 Amazon has the Tripp Lite 12 Outlet Rackmount network-grade pdu power Strip, Front/Rear facing, 20A, 15ft cord w/ L5-20P plug (RS-1215-20T) for $50 with free shipping. Sells for $66+ Highest Price. Deals for $23 Lowest Price. Normally $51+.